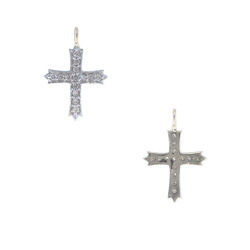 This Gold Cross Pendant is highly fashionable and has a shiny appearance. 2) 2 Years Warranty Against Tarnish. 3) Affordable luxury jewellery, durable and looks absolutely like Real Gold jewellery. 4) Elegant jewellery - Also suitable for people with sensitive skin. 5) Wide range of designs that can be worn with traditional and western outfits. Features: Gold pendants. Indian pendants design, Sapphire cross pendant, Yellow gold cross pendant. 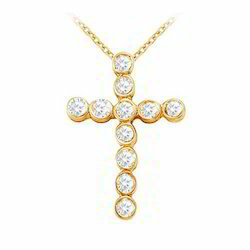 We are offering Yellow Gold Sapphire Cross Pendant to our clients. This Burse is made of Damask (Brocade) Fabric with Cross Designs. The burse measures 9 inches x 9 inches. The cross is directly embroidered to the Fabric in Metallic golden threads and the edges are lined with a Golden trim. A Lovable 10k yellow gold Cross that is Caved beautifully, and has a 0.03 carat white Diamond on its intersection.